Yes, a great version. Frogger was also based on a Konami Z80 + AY. An arcade emulation was fine too, so I don't know if he had "steel" the original routines or redone all. "The game uses two Z80 microprocessors and two AY-3-8910 PSGs for sound." Not sure how feasible it would be to emulate it? The game looks simple enough, except for the scrolling. Can the CPC do it that well? The bg is solid, only the clouds (things floating around) move. You don't need masked sprites for that (although you'll need them for everything else). Not sure if the playing area could be that large, but I think it would be doable. Sure, I know that. But I think it is not a real problem. Loading from a floppy and using the CPC expansion RAM bank switching should resolve that with only one CPU. About the 2x AY and the rasters display, the PlayCity can perfectly do the arcade job. Finally, there is no scrolling if you remove the clouds as the ship is always at the center. That means, only sprites are moving around it and masking should be not required. So... when will you have finished it? Hahaha... Better to stop here the Off-Topic. Today we can confirm great news for all Amstrad developers and fans. Philip Oliver has confirmed that he and his brother Andrew will be jury for #CPCRetroDev 2016. 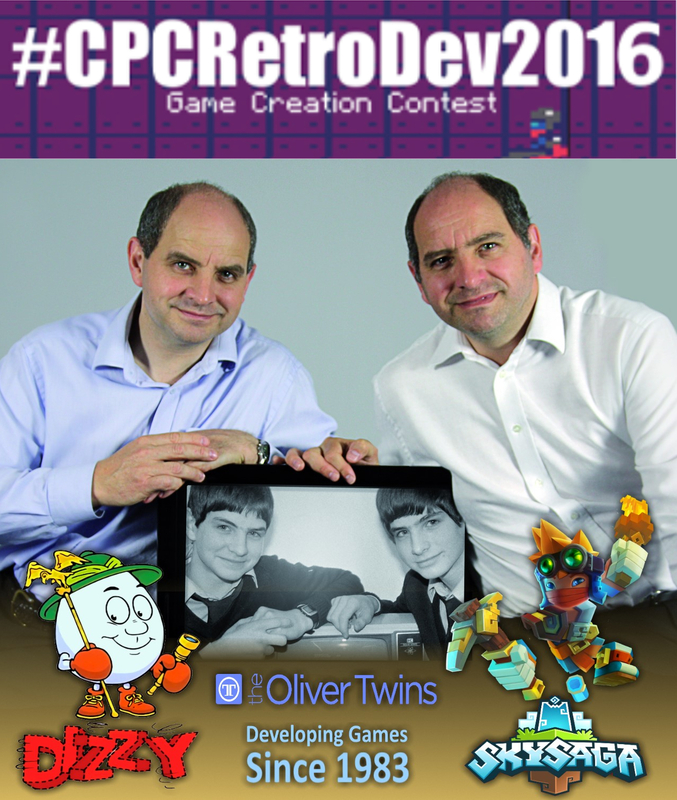 The Oliver Twins will be judging the entries, give written feedback to all participants and will also be present here, at the University of Alicante, to hand awards to winners in person. Moreover, they will also give a presentation and be available for signing games. That will be next 5th of November, during RetroConsolas Alicante 2016. You will find all the details at #CPCRetroDev website. Hope you enjoy this news as much as we do! Ok, sound will probably use up around 10% of the CPU time, maybe 15%. So one Z80 should be enough. And for the two AY's we got TotO's nice PlayCity. (I'm more concerned about the way the background scrolls, there seem to be two levels, but I may be wrong). I could of been lead to believe that photo of them from 1983 was really 1963! It's great to see the interest of veteran game developper about this contest. I really hope there will be a lot of entries for CpcRetroDev 2016. Page created in 0.222 seconds with 74 queries.